Nome della vigna / Vineyard name: Barrucciano and Noce. Ettari / Hectares: 12 Ha. Quota / Altitude: 270 m / 886 ft.
Suoli / Type of soils: Limestone, with silt below composed of marine sand and clay. 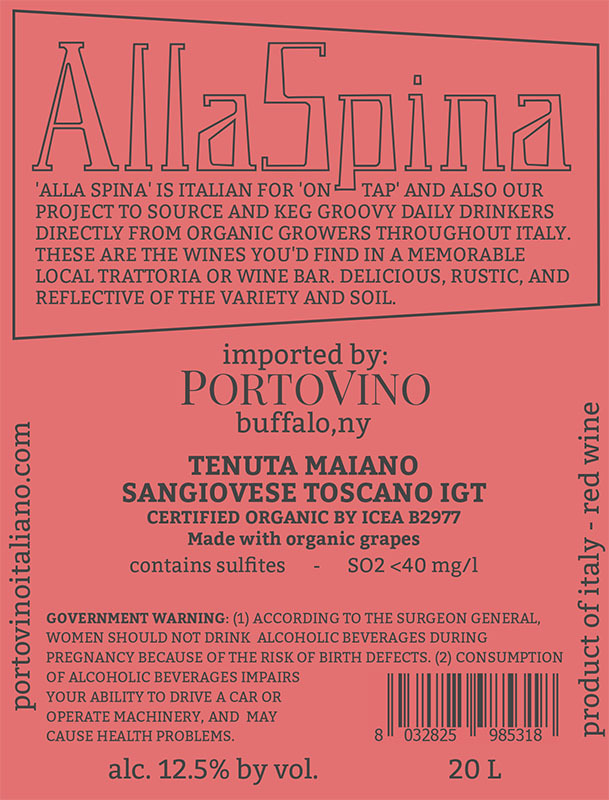 Vitigni / Varieties: Sangiovese (CH10 and R24. clones). Densità / Planting Density: 4200 vines/hectare. Allevamento / Trellis system: Cordon (cordone speronato). Resa / Yield: 11000 kilograms / hectare. Fermentazione alcolica / Alcoholic fermentation: The bunches are destemmed and pressed, and must is put in concrete tanks. The fermentation starts on the second day and lasts for 15 days around 28°C. Fermentazione malolattica / Malolactic fermentation: Spontaneous, in December. Affinamento / Élevage: 3 months in cement. Chiarificazione, filtrazione / Clarification, filtration: Filtered with 1 micron cardboard filters. Zolfo / Sulphur: 32 mg/L total, 12 mg/L free. Produzione annua / Annual production: 320 20L Kegs.